There are two local opportunities this week to screen and discuss the documentary “How to Start a Revolution” about Gene Sharp’s long career and groundbreaking work in developing the theory of nonviolent strategic action. Pendle Hill will show the film on July 1, 7:30-9:00 p.m. as part of its First Mondays series. Professor Lee Smithey will lead a discussion about the film. Download a flyer. Envision Peace Museum will show the film on July 3, 6:30-9:00 p.m. with a panel discussion afterwards including Professor Lee Smithey, Arzu Geybulla in Turkey, and Stephanie Ambar in Brazil. Download a flyer. Download a flyer. Swarthmore College is privileged to be the home of the papers of the Albert Einstein Institution. We are happy to announce that Dr. Wendy Chmielewski, Curator of the Swarthmore College Peace Collection and a member of the Peace and Conflict Studies steering committee, has been awarded a fellowship from the Gilder-Lehrman Institute for American History to conduct further research in support of the project: “Her Hat Was in the Ring: U.S. Women Elected to Political Office Before 1920“. Visit the project’s website. This web site identifies women candidates for elective office in the late 19th and early 20th centuries, giving biographical information for each woman, information about her campaign, party affiliation, photographs, and lists of selected resources. We estimate that women ran in well over 3,500 campaigns by 1920. Currently, our database contains biographical records for 2,579 women, who ran in 3,633campaigns. We would like to extend a hearty thanks to three wonderful colleagues who came to Swarthmore and examined Peace and Conflict Studies students in May. It is a real privilege to benefit from your expertise! Hallowell’s words carried weight. He was a well-known scientist and educator. His boarding school in Alexandria, Va., was known particularly for mathematics. Paradoxically for a lifelong Quaker, one of his better-known fellow alumni was Robert E. Lee, future commander of the Confederate Army, who studied mathematics with Hallowell to prepare himself for West Point. In 1860, Hallowell became the first president of Maryland Agricultural College, now the University of Maryland, on the condition that the school would not employ slave labor. 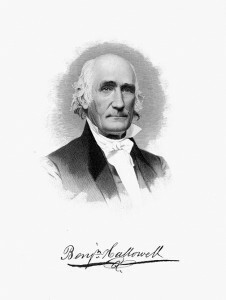 During the Civil War, Hallowell was clerk of the Baltimore Yearly Meeting, a body that included Virginia and Maryland. A confirmed pacifist, Hallowell nevertheless rejoiced when his former pupil Gen. Lee was driven from Pennsylvania. After the war, Hallowell, acting for the Baltimore Yearly Meeting, wrote to president-elect Ulysses S. Grant, advocating peaceful relations with the Indian nations of the West. Under Grant’s “Peace Policy,” some Indian agencies in the Plains were staffed by Quakers. In 1872, his old friend Edward Parrish, after serving as the first president of Swarthmore College, died in the West while on a mission for the Quakers to broker a peace treaty between the Indian nations of the Plains and the United States. Congratulations to all of the students of the class of 2013! It was a great day for Commencement, and we enjoyed meeting the friends and family of many of our Peace and Conflict Studies students. We love having new alumnae in the program. Stay in touch!